Winter can be grey and grim, and the wet weather and freezing temperatures mean that your horse is likely to spend more time safely in their stable. Whilst this may be a protection from the elements, there are risks associated with this which you should be aware of and monitor regularly, to ensure that your horse remains in good health throughout the cooler months. Here at The Insurance Emporium, we want to help you prioritise your horse’s health, so we asked our horse health expert for the key information on preventing lower airway disease in your equine pal. The most commonly found lower airway conditions in adult horses are recurrent airway obstruction (RAO), and inflammatory airway disease (IAD), neither of which are caused by an infectious agent. Instead, symptoms develop through inhalation of particles such as dust, fungal spores or ammonia. RAO is an allergic response to these particles, whilst IAD is a non-allergic inflammatory response. You may spot symptoms such as nasal discharge, reduced performance, coughing and breathing difficulties. If your horse develops any of these symptoms, your first action should be to contact your vet. Your horse may require a bronchodilator if acute episodes occur, or a course of corticosteroids to relieve chronic symptoms. There are also steps you can take to manage and reduce RAO and IAD in your daily routine. 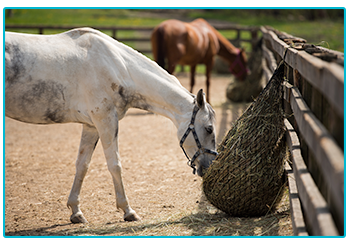 Feed is a key factor in reducing the risks of lower airway disease, and offers an easy way to protect your horse and restrict the possibility of conditions developing. Forage quality is important, and hay needs to be soaked or steamed for a period of time to reduce respirable particles. These conditions are greatly improved when the horse is turned out. 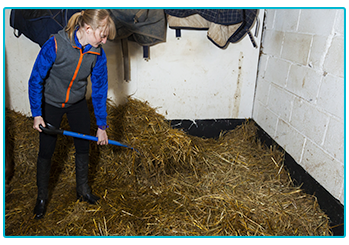 It’s advised that this happens as much as possible, particularly at times of the day where there are higher levels of dust, such as during mucking out, bedding down and feeding. This may be more difficult during the colder months. 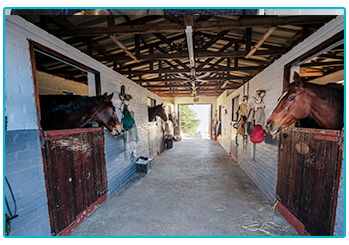 Where stabling is necessary, there are measures which can be taken to improve air hygiene and ventilation. Dust extracted woodchip or paper bedding is preferable to straw bedding. Rubber matting can also reduce bedding requirements and help to minimise the amount of dust. Stables should be skipped out regularly to reduce mould spores and ammonia particles, and American style ‘barn’ stabling should be avoided as much as possible. Obviously the number one priority for all horse owners is the safety and wellbeing of our equine friends, and if you have any concerns or worries about your horses wellbeing, your first port of call should always be a vet. Luckily, there are also a number of steps you can take to reduce and manage the risk of lower airway diseases, and keep your horse happy and healthy all year round.